The general consensus has always been that the higher up you start in the grid, the higher you’ll finish in the race. This makes sense. The fastest cars qualify at the front of the grid and we expect them to perform well in the race too. But what exactly is the relationship between starting position and finishing position? Can we tell a lot about where a driver is likely to finish based on where he starts? These are a couple of the questions I want to look at today. 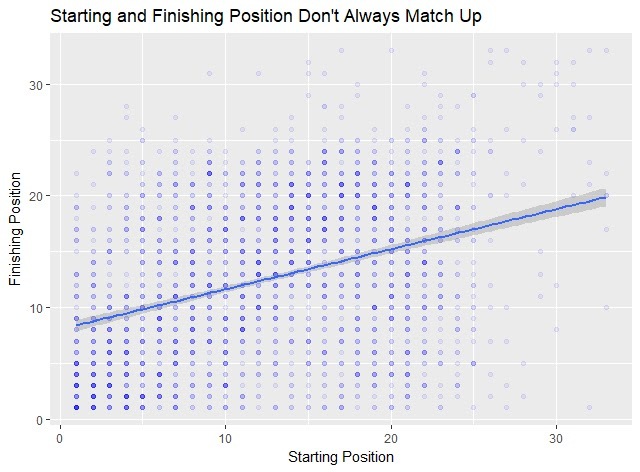 Using data from 2012-2017, I looked at how starting position correlates with finishing position. Here’s a plot of finishing position vs. starting position for those years, with a trend line added. 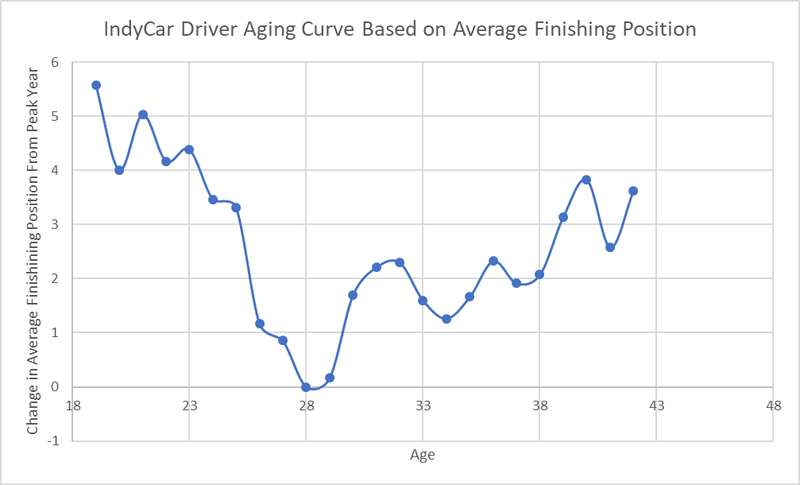 A driver’s starting position explains only 12.9% of their variation in finishing position, meaning that a driver’s starting position isn’t very predictive of their finishing position. If you just know where a driver started, you can’t predict their finishing position with much accuracy. I was expecting this number to be a little higher, but the more I thought about it, the more it started to make sense. There are a lot more factors that go into where a driver ends up finishing a race than simply where he starts. Accidents, untimely cautions, and differences in strategy are just some of the things that can make high qualifying drivers perform poorly and let poor qualifying drivers sneak into the top half of the field. Qualifying position is only one part of the puzzle that determines the results of a race. And on top of that, the difference between say 12th and 13th place is usually down to more luck of the draw then driver skill, making the prediction of individual places difficult. But this leads us to another question: what are the factors that truly impact where a driver finishes a race. Are practice results predictive of race performance? Or how a driver has raced at that track in the past? Or is racing inherently subject to a lot of randomness and it can’t be predicted with much accuracy? These are all interesting questions that I would like to tackle in the future, but trying to determine how they all interact with each other would be too much for one article. I would like to look at these factors one by one in different articles in the future (starting with qualifying position in this one). Race prediction is obviously the ultimate goal, but before we can determine if it’s even a feasible goal, we need to see what the different factors are that go into determining where drivers end up in a race. What we do know now is one part of the bigger picture: qualifying position is a statistically significant predictor of finishing position, but it isn’t a very good one. It explains just around 13% of the variation in finishing position and has a standard error of 6.7 places. Qualifying is a good place to start our investigation into finishing position, and I plan on looking at the other aspects that go into race performance in future posts. Graph of the Day is a short piece where I post an interesting graph for chart I came across while doing research. 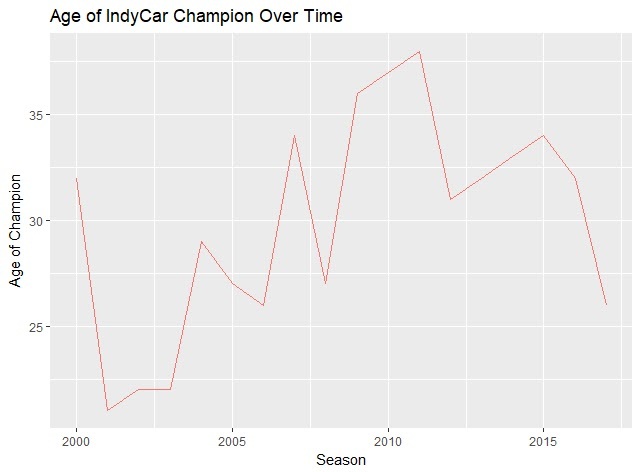 Today’s graph looks out how the age of the IndyCar champion has changed over the years. 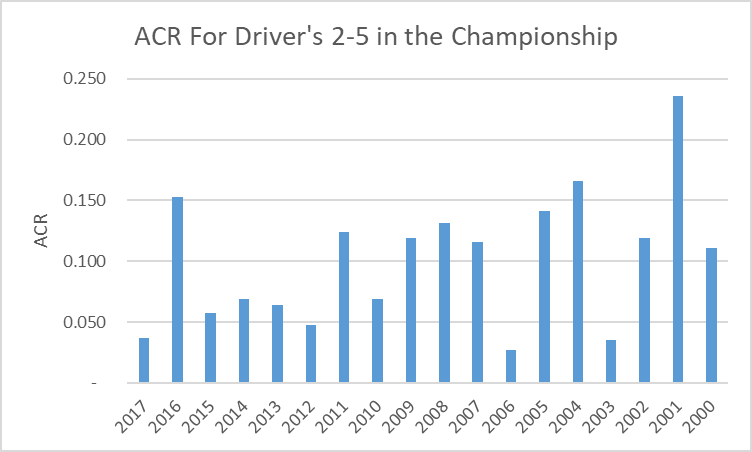 Before Newgarden’s title at the age of 26, it appeared the age of the champion was rising ever so slightly on average. 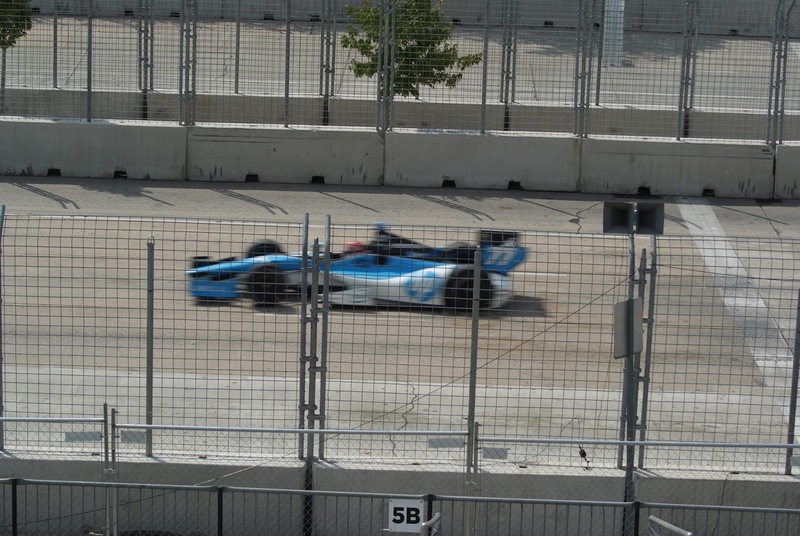 Newgarden was the fifth youngest champion since the year 2000. 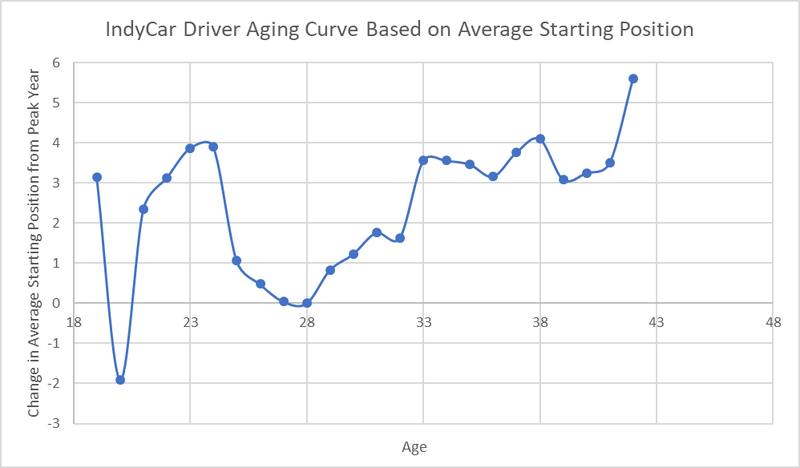 It’ll be interesting to see how the younger drivers in the series (Newgarden, Rahal, Rossi) change this trend over time. 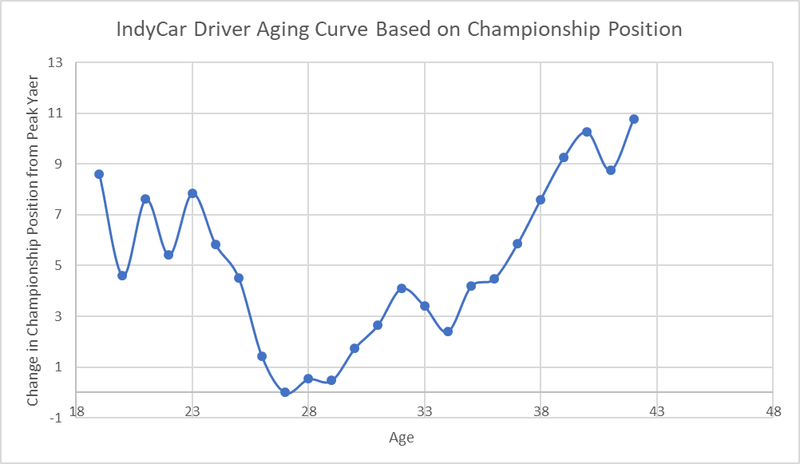 As the veteran drivers start to retire, I’d expect the average age of the series champ to tick down a little. 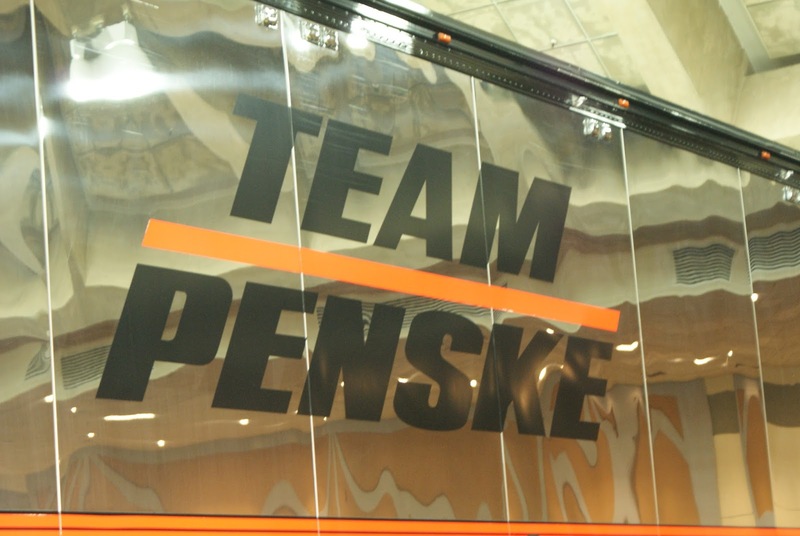 In the last article I wrote, I talked about a way to measure the competitiveness of a given IndyCar season. If you haven’t read that article, I would recommend doing so before continuing with this one. That measure was a fairly good first attempt at measuring competitiveness: it gave a good idea of the spread of the field and how dominant the champion was. Kyle Brown, a fellow IndyCar blogger who focuses on the statistics and data of the sport, left a comment on that post suggesting a different approach to measuring competitiveness that built off of what I started with. The advantage of this system over my original is that it takes into account how close each driver was to the champion as opposed to just the X place driver. For example, consider the following two seasons. In hypothetical season A, the top-9 drivers were all separated by one point each and the tenth driver was 200 points back from the champion. In hypothetical season B, the top-9 drivers were all separated by 20 points and and tenth driver was 200 points back from the champion. Under my original method, these seasons would both have the same competitiveness ratio for the top-10 of the field. Under the new system, season A would be considered more competitive (as it should be, because there are more drivers in the championship battle and close to each other) because it’s ACR would be less than season B’s. 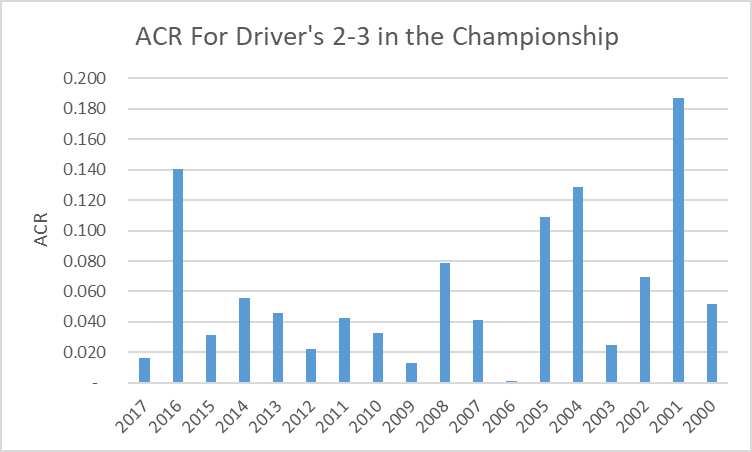 My original method is a good measure of thecompetitiveness in terms of the spread of the field, but ACR is a better measure of how competitive all of the drivers were in terms of the championship battle. Once again, this process gives us a ratio for each season from 0 to 1. The former would be a perfectly competitive season (all drivers score the same number of points) and the latter would be a perfectly non-competitive season (there is one driver winning every possible point in every race and the other drivers aren’t even competing). Now that we’ve got the description out of the way, we can get into the results. 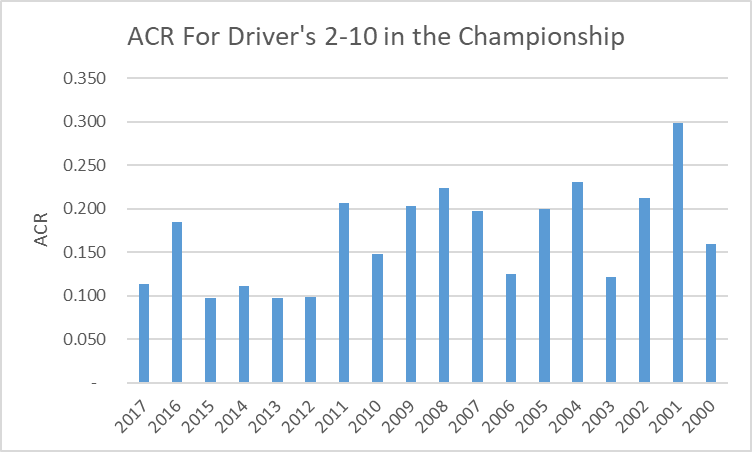 First, let’s look at the ACR for the top-10 drivers in the seasons 2000-17. 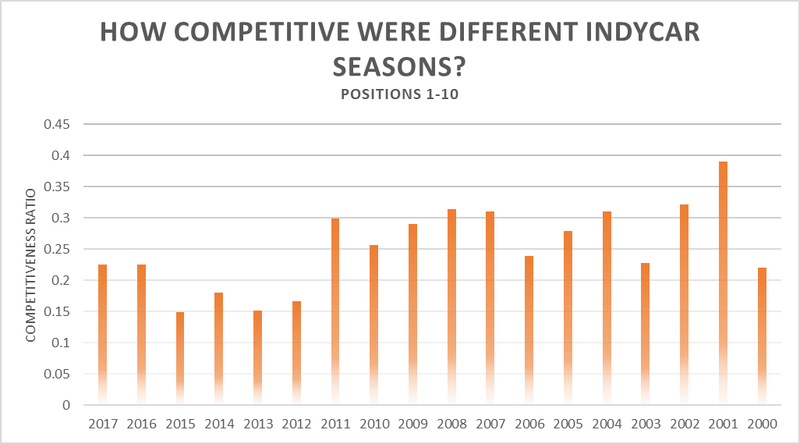 The 2015 and 2013 seasons both had an ACR of 0.097, making them the most competitive seasons in terms of top-10 competitiveness in our data set. For comparison, 2015 — when Juan Pablo Montoya and Scott Dixon ended up tied in the points after Sonoma — was the most competitive season by my original method. 2001 was the least competitive year as Sam Hornish Jr. won the championship 100 points clear of the field. We see the same drop off at the 2012 season that we saw the last time around, and once again, I think this could be because of the adoption of the Dallara DW-12 chassis. It seems to have made the field more competitive on the whole (or at least the top half of the field). We get the following graph for the top-5 spots in the championship. The results show us that 2006 had the most competitive top-5 championship. This season the top four places in the championship were separated by just 15 points. 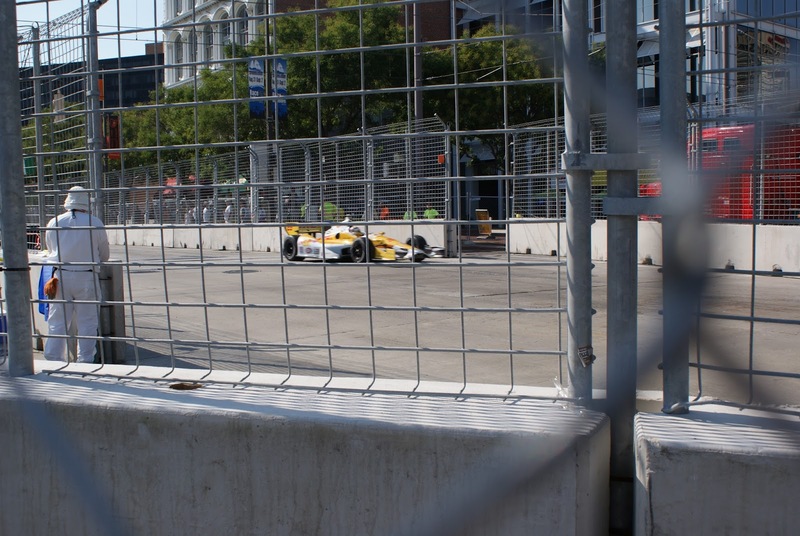 Hornish Jr. and Dan Wheldon were tied after the last race and the former won on a tiebreaker. Six different drivers took home race wins and nine different drivers finished on the podium. And finally, we have the graph for the top-3. 2006 was the most competitive season for the top-3 places in the championship, for the same reasons mentioned above. 2001 was the least competitive season for the top-3, largely in part because the champion was 100 points clear of the runner up. And in 2016, Simon Pagenaud won by 127 points, making it the 2nd least competitive season in our time frame with an ACR of 0.14. Using ACR as opposed to CR for a given place provides a more accurate measure for the competitiveness of a season. It takes into account all places within the specified range and shows how competitive the championship battle really was, which is, at the end of the day, what we all really care about. Exciting championship battles are a sign of an exciting season. I would say using ACR for the top-5 or top-10 drivers is my preferred range when looking at how competitive a season is, as that’s where most of the action on track takes place each race. I’d prefer a season with a lower top-5 or top-10 ACR over one with just a super low top-3 ACR, because that means many drivers are in the hunt, even if it means the gap to second or third isn’t incredibly low (<10 points). People could have different opinions on which method they prefer to look at of course. Thanks again to Kyle for the great suggestion and help in compiling the data for this project.